A WYSIWYG editor is a content creation tool that allows the author to see how the content will look while it is being created in terms of images, fonts, spacing, and text blocks. The WYSIWYG editor conceals the descriptive codes (markup language) so that the author can focus on editing content in a view very similar to how it will be displayed in it’s published form. If the author wants to view the code, the ‘Source’ button will display the code or markup in the editor. 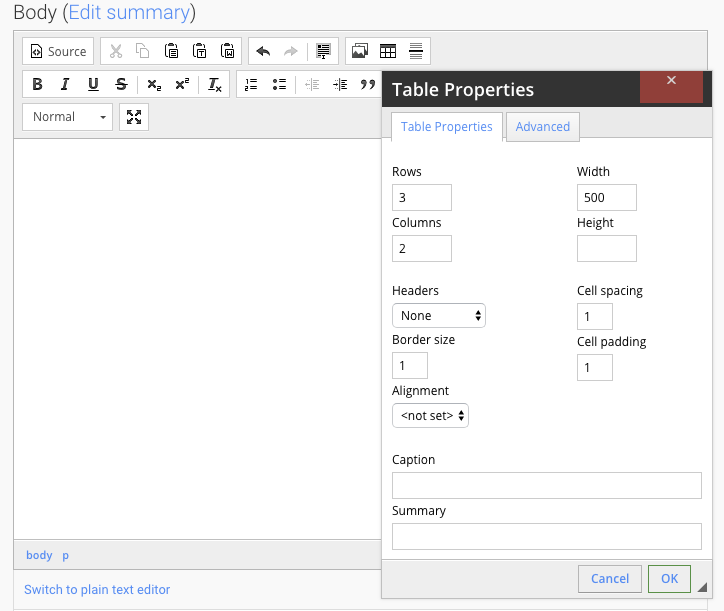 The Stacks WYSIWYG editor appears in many of the stacks features and tools such as Pages, Collections, Databases, Directory Listings, Easy Forms, New Articles, and more. The WYSIWYG editor is an open blank field where the author can create content with several icons, tools, and buttons listed above it. Hover over each of the buttons in the menu to view a description of what each button does. Place your cursor in the blank field to begin creating content. 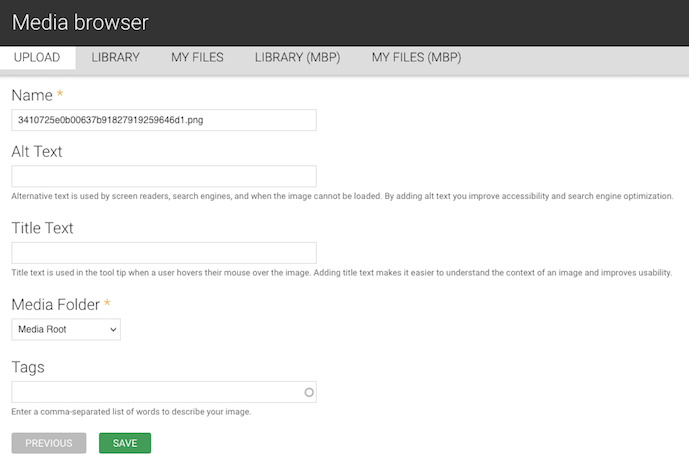 You can type your content here, format your text, and add images, tables, and links. See the menu at the left to see specific instructions. Note: Using these paste buttons allows you to copy text from Word documents, or other documents or websites and paste them here stripped of all excess coding that could cause the text to display incorrectly. Format your text by using the buttons above the blank field in the WYSIWYG editor. Use the Number button to create a numbered list - note that you can restart the numbering at any point by right-clicking on your mouse beside the number to see the Numbered List Properties menu. Add title text - this will display when the user hovers over the image with their mouse. 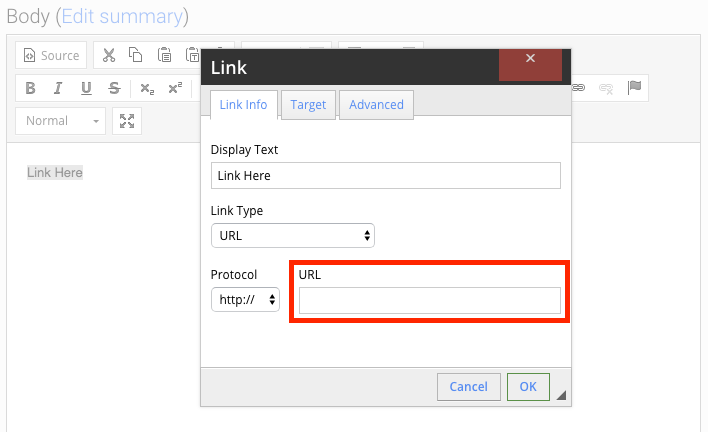 To add a link to your page, highlight the word in your text that you would like to use as your link. The Anchor button allows you to create a sort of bookmark on the page with a text link or image. This anchor allows you to link from elsewhere to a specific point on this page. For example, if you had an agenda or table of contents at the top a page, you could make each item in the table of contents or agenda link directly to the specific paragraph it refers to. 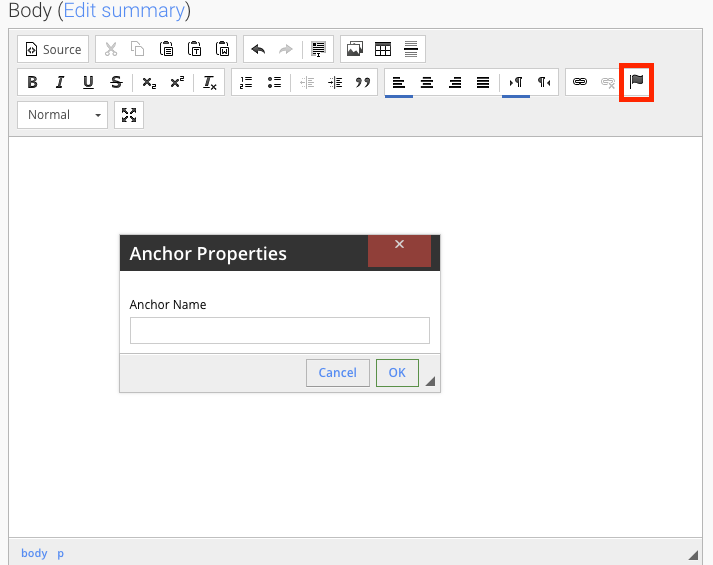 To add an anchor to your page, first, place your cursor on the page where you would like to insert the anchor. Click the anchor button - it looks like a flag. 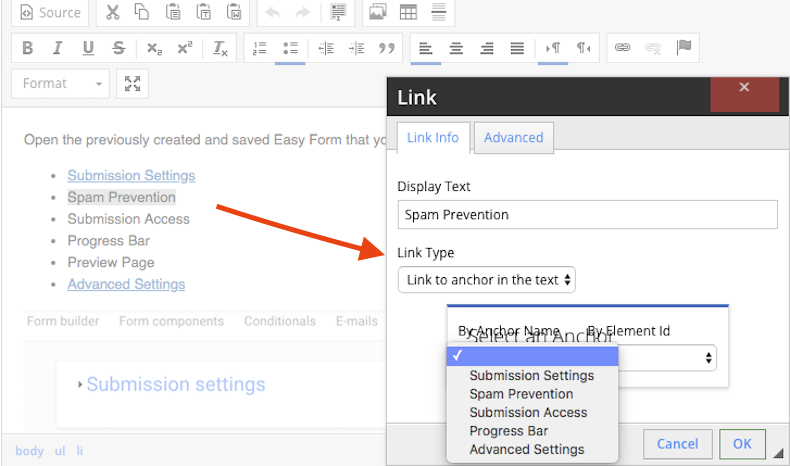 Now select the text that you want to link to that anchor. Highlight the words that will form your link. The WYSIWYG editor conceals the descriptive codes (markup language) so that the author can focus on editing content in a view very similar to how it will be displayed in it’s published form. If the author wants to view the code, the ‘Source’ button will display the code or markup in the editor. You can now see a view of your content including the markup code. Note the blue line under the 'Source' button to indicate that the ''Source' view is now displayed.